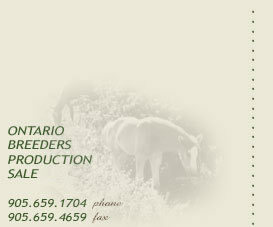 The Ontario Breeders Production Sale was founded by three of Ontario's leading Crossbred Breeders. Barb Bowen, Jim MacKay & Bev Watson. We breed and raise our horses specifically for our production sale and private sales. Our breeding stock is selected �not by chance� and the offspring therefore is an elite product. The line-up of horses each year is handpicked specifically for the sale. Because we are proud of our product we want to disclose what the buyer wishes to know! You can trust that when you buy a horse at our sale, the x-rays are available and the horses are all started under saddle. Success stories! Ask the dozens of repeat buyers that have become dear friends over the years! Need we say more! Barb Bowen, Jim MacKay and Valerie Williams have well over 100 years collectively in the horse industry in their generation alone! Born in the Township of Flamborough in 1949, Barb Bowen is Orchard Park Stables. 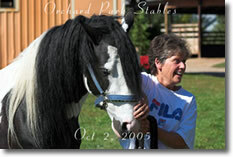 Since founding Orchard Park Stables in 1976, she has been breeding crossbreds and selling horses as her livelihood. As a third-generation horseperson in the Flamborough area, Barb carries on a family tradition and equine lineage that goes back over one hundred years. She follows in the footsteps of her father, Howard G. Smith (noted horseman) and grandfather, S. Frank Smith (noted horseman and auctioneer). The youngest of six children, to whom �Fisher Price� meant �HORSE�, her life skills degree in horsemanship is hard-earned. Orchard Park Stables 'get', have been sold throughout the United States and Canada. Breeding for temperament as well as ability and looks, the offspring have excelled as Children's mounts, Adult-Amateur as well as professional mounts and all around show horses. It is with pleasure and pride that Barb offers for sale the progeny that has taken generations of knowledge and breeding to produce. Some of these horses are third and fourth generation born at Orchard Park Stables. Because Orchard Park Stables has sold to so many "happy horse owners", we have an archive of letters, thank you and Christmas cards, accompanied by pictures of their new found happiness. We have shared some of these with you and they can be seen on our testimonials page. Jim MacKay is the man behind the Shady Maple horses. No stranger to the horse industry in Ontario, Mr. MacKay started his horse show career in 1965 and has been raising and exhibiting crossbreds ever since. Shady Maple boasts a herd of more than 150 Clydesdales, Hackneys and Commercials (crossbreds) combined. Amongst the brood, Jim and his son Steve (who is Jim�s right hand in the business) have a good selection of well-bred hackney stallions representing the quality of the breed. If a person speaks of a Canadian Crossbred, then Jim MacKay�s name will be in the same sentence. His horses have been sold all over North America, not only for driving, but excelling in English tack for jumping, dressage, eventing, field hunting, and as Police mounts. When visiting Bermuda, it will likely be Jim�s teams pulling the carriages. Each year, you can see Jim MacKay at the Royal Winter Fair in Toronto, Canada. He has been the Ring Master at the Royal for more than fifteen years. It is with pride that Shady Maple Farms presents a fine selection of driving and riding horses at the Ontario Breeders Production Sale.